American naval vessels in the early twentieth century were honored with exquisitely designed hollow-ware silver sets. This punch cup belongs to the 67-piece silver set built for the USS Florida, commissioned in September, 1911. 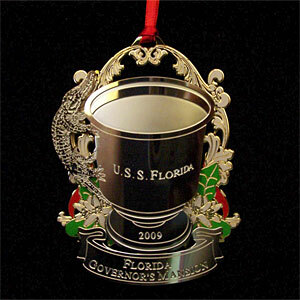 The USS Florida Presentation Silver Collection, created by the Gorham Silver Company in Providence, Rhode Island, originally included 24 punch cups with distinctive alligator-form handles. These sterling silver cups accompanied a monumental 12 gallon punch bowl. Replicated in a stunning 24kt. gold finish and crafted in America, this seventh-in-an ongoing series Collector's Edition Ornament makes the perfect holiday gift.